Lance Corporal Adam C. Conboy was born in Philadelphia, Pennsylvania, on 9 August 1984. He joined the United States Marine Corps on 21 March 2005, at Marine Corps Recruit Depot Parris Island. After graduating as a Private First Class meritoriously from the recruit depot, he continued his training at the School of Infantry (SOI), Camp Lejeune, North Carolina. 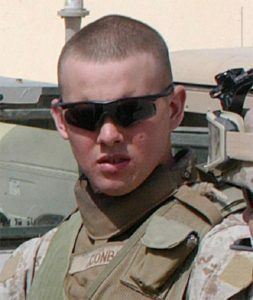 Upon graduation from SOI, Lance Corporal Conboy was assigned as an 0311 Rifleman to 3d Battalion, 3d Marines, on 22 September 2005. He deployed to Iraq in support of Operation IRAQI FREEDOM in March 2006 where he died on 12 May 2006. He is survived by his mother, Mary Warner, and his father, Charles Conboy. Mary Conboy’s children aren’t the only ones she’ll be receiving cards from this Mother’s Day weekend. Since 2007, soldiers across America have shown their support for the Roxborough mother of seven on the holiday that also commemorates her oldest son’s death. Her son, Adam Conboy, died while serving as a Marine lance corporal in Iraq in 2006. He passed away two days before Mother’s Day. To honor her son’s memory, Conboy quickly founded Operation Bedding, a nonprofit organization that has sent more than 12,000 packages of blankets, socks, pillows, snacks and more to service men and women in Afghanistan and Iraq over the past seven years. This year, due to a lack of financial donations, the organization was forced to shut down. Operation Bedding started off as a collection space at the Roxborough Review in 2006 but soon moved into its own office on Main Street in Manayunk and eventually into its latest space on Ridge Avenue in Roxborough. “I never thought it would take off the way it did,” said Conboy. She initially started her military collection by asking the congregation of Wellspring Church in Skippack, Pa. for donations. Word of the Marine mom’s cause spread quickly, and within a year of sending her first platoon package overseas, Mary Conboy was featured on the front page of The Philadelphia Inquirer on Mother’s Day in 2007. Conboy said the article sparked an overwhelming donation surge, contributing to tens of thousands of dollars raised for the organization in one day. With war fatalities mentioned daily in the news in 2007, Conboy said everyone wanted to contribute in some way. “This gave them a vehicle,” she said. Over the next several years, community members contacted Operation Bedding with the names of local soldiers on active duty, and it was those men and women whose platoons benefitted most from the packages. Postage costs for each shipment topped $1,000. Conboy was able to stretch the money raised in the direct aftermath of the media coverage through three years, and with other donations and semi-annual fundraisers, Adam Conboy’s family and friends kept their organization running as long as they could. Conboy has received hundreds of letters thanking her for the care packages. In one, a naval captain and Roxborough native, George Westwood, thanked her for sending pillows to his sailors. Conboy says that financial contributions dwindled when the Iraq troop withdrawal was announced. After paying much of the past year’s expenses out of her own pocket, she decided this was the right time to shut down, but, she says, she’ll continue to send smaller packages on her own dime. Although Operation Bedding has disbanded, Conboy isn’t finished with her service to the military. Along with Wayne Lutz, she co-founded Big Brothers in Arms, a support network that pairs recent veterans with those who served in Vietnam or wars prior. And for the past 18 months, Conboy has run Project Outreach, an aid for veterans who need help re-entering society. Project Outreach puts callers in touch with services like that of the Philadelphia Veterans Multi-Service and Education Center on North Fourth Street, which can lead veterans toward whatever camaraderie, mental help, or benefits assistance they may need. Conboy says she sees the closure of Operation Bedding as an indication of what America’s attitude is towards veterans: it isn’t that civilians don’t care, it’s that they don’t know what to do. Mary Conboy says that this type of service has helped her and her six other children process Adam’s death. “I realized Operation Bedding gave them something to do with their grief,” she said. Adam’s youngest sibling, his sister, was one when he died. Until she could do so herself, she grew up watching her family pack boxes for soldiers and setting up tables at fundraisers. This year, Mother’s Day falls on the seventh anniversary of Adam’s death. When she wakes up on Sunday, Conboy will go with her two youngest children, now 8 and 10, to visit Adam’s gravestone. She then hopes to spend a quiet day with her family at home.